The teacher accompanies his/her class throughout the process. XperiLAB.be tackles various ways of understanding science; it will fit smoothly into the learning experience of the group. Like any learning, the experience of the XperiLAB.be truck has to be prepared (before), lived (during) and exploited (after). That way XperiLAB.be will be more than a fireworks display with nothing to follow it up. A couple of weeks before the visit the pupils and their teacher will receive a short file. With it they prepare themselves for the visit: form small groups, learn new terminology, have notion of using a microscope, a thermal camera or a counter clicker. The teacher can also appeal to the teaching kit (available online, 'Afterwards'), including background information on the various subjects brought up during the visit. Once in XperiLAB.be the pupils put on a white lab coat. 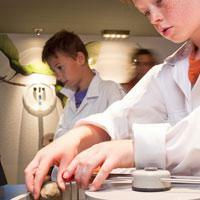 Working in small groups of two to three pupils, spread across three labs, they will perform three experiments. 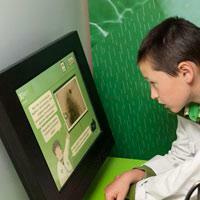 The pupils are guided by a virtual animator on a touch screen. A countdown adds a hint of adrenalin: after 15 minutes, we change activity! 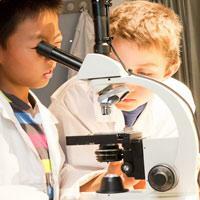 Moreover, they can collect points during the experiments, which are totalled for the class. Did they succeed their mission: being real scientists? At the end, the pupils gather together and pool their learning, under the guidance of the activity leader. XperiLAB.be wants to be an informal learning experience. 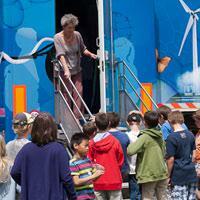 The true learning happens after the visit to the science lorry. Therefore a complete teaching kit was composed (available online). This kit is a vital tool for the teacher and her/his class, which includes links to related subjects and learning targets and suggestions for activities in the classroom or in the field.